The green circle in your messaging has indicated a universal “online” status on many different social platforms, but LinkedIn’s green circle also includes an alternative that many users do not know the meaning behind—the hollow green circle. 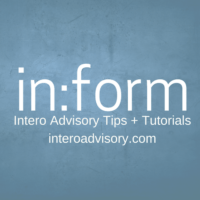 This Quick Tip is to clear up any confusion, as well as provide knowledge on how you may want to reach out to a connection if you are looking for a quick response. 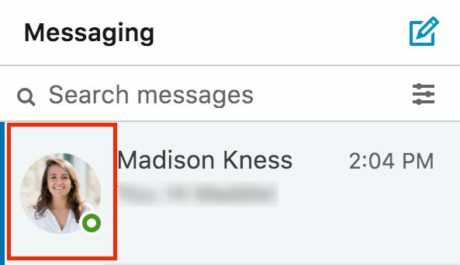 There are two different green colored circles that will appear next to your connections’ name in your LinkedIn messaging inbox. The first green circle that you will see next to a connections’ picture is solid green. This indicates that your connection is currently active on LinkedIn, and they will immediately receive a notification that you sent them a message. The second green circle that you will see inside your messaging inbox will be a hollow green circle, or a circle with a white dot inside. However you perceive it, this will indicate that this connection is currently inactive online, but they have their push notifications turned on for LinkedIn so they will receive a notification when the message is sent as well. 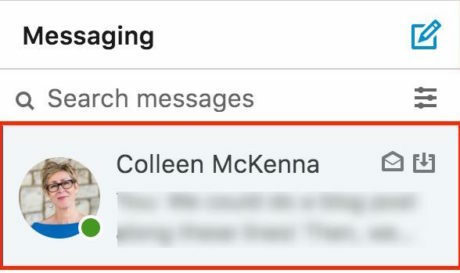 If there is no green circle in any form next to a connection’s name, this tells users that the connection is not active on LinkedIn and does not have their push notifications turned on, therefore it could result in a much longer response time than ones with a solid or hollow green circle. You can also access your messaging in a pop-up window at the bottom right corner of any page on LinkedIn, such as your homepage, “My Network” page, and the “Notifications” page. The solid or hollow green dot will appear in the same place that it does in your expanded messaging page. This separate window is convenient for a more instant message approach as well as for accessibility.